Is Loopy Loyalty available in my country? Yes. Loopy Loyalty is available in every country! You can use Loopy Loyalty in every country. For your customers who use iOS devices, they will save and use your digital loyalty card in Apple Wallet. This application is installed as standard in all iPhone runnings iOS6 and above (which is basically all iPhones). For your customers who use Android devices, they will save and your your digital loyalty card in either Google Pay (the default Google wallet and now available in 28 countries) or Wallet Passes (an Apple Wallet copy cat app) that is available in the Google Play store in all countries. If your customer is an iOS user then they will use Apple Wallet. If they are an Android user in a Google Pay supported country then they will use Google Pay. If they are an Android user in a country that doesn't yet support Google Pay they will use Wallet Passes. 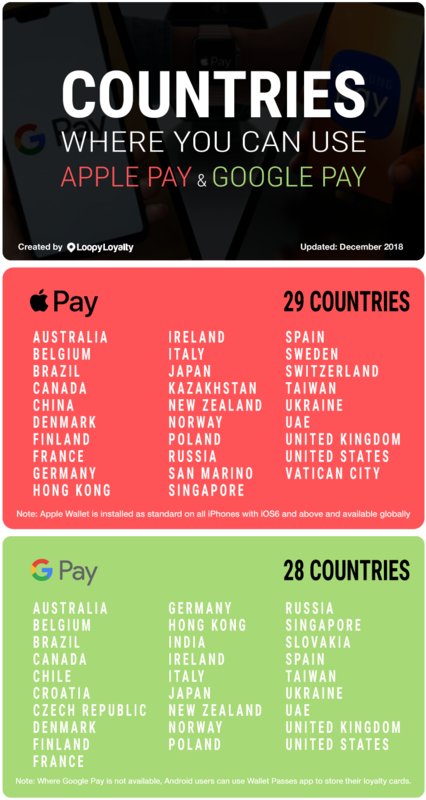 Is Apple Wallet and Google Pay available in my country?